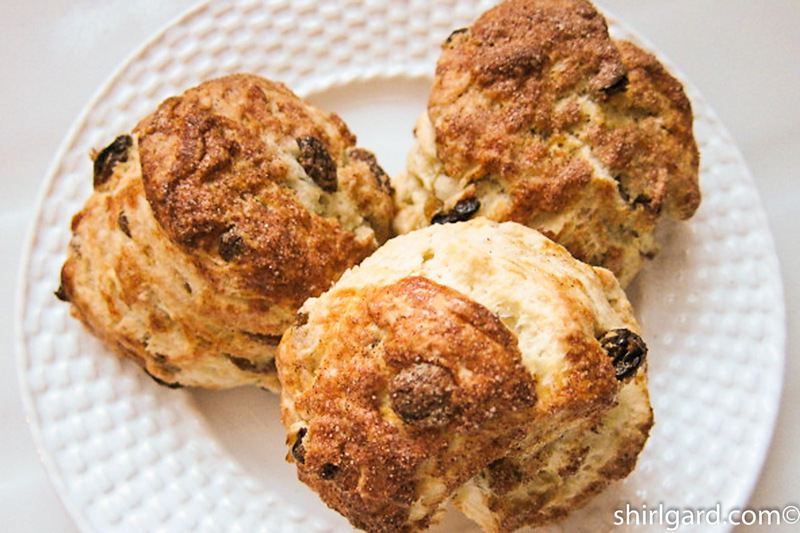 Sultana Scones have both Irish and British roots and the word “Sultana” is their term for what we call golden raisins. These Sultana Scones are not only speckled with plump golden raisins, they are golden brown and crusty, with a soft interior crumb. They are great as a breakfast treat, or afternoon tea, if you happen to be in the British mode. 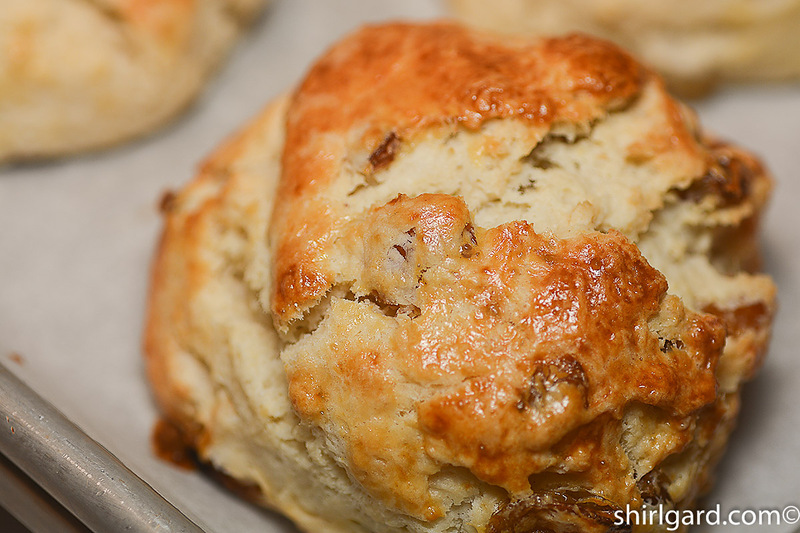 This is just the kind of recipe that I like to mix by hand: the handmade scone. 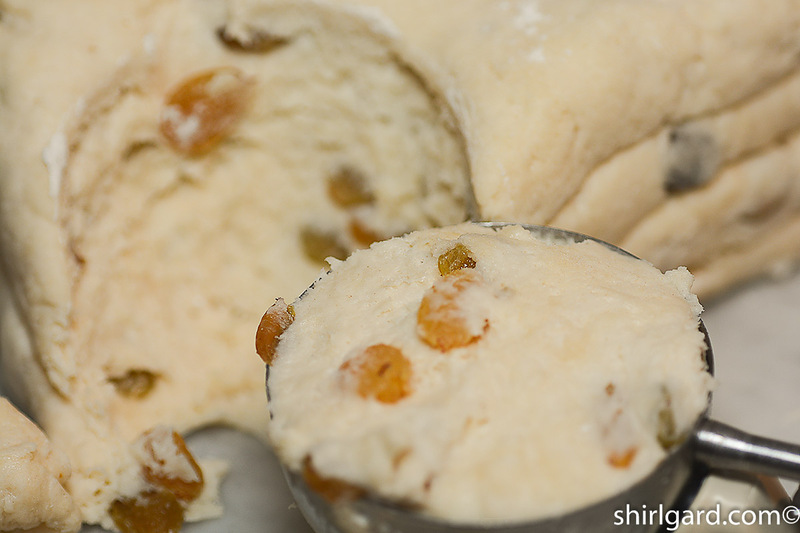 There are a lot of different ways to mix scone dough, which is a type of dough where the butter has to in some way get incorporated directly into the flour like making biscuits. But what is the best way? A recipe might say something like “cut the butter into the flour mixture until it resembles coarse meal flecked with pea-size pieces of butter”. 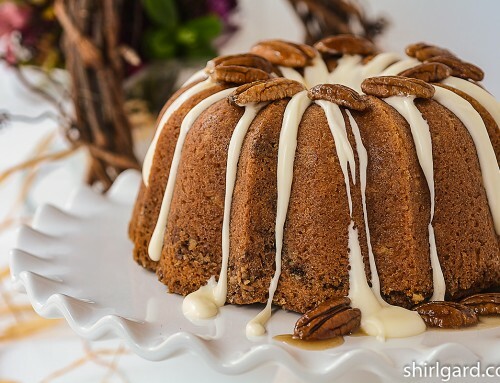 The recipe might also tell you to use two table knives or a pastry cutter to do this. Or, another recipe might say to use a mixer, fitted with the paddle attachment. 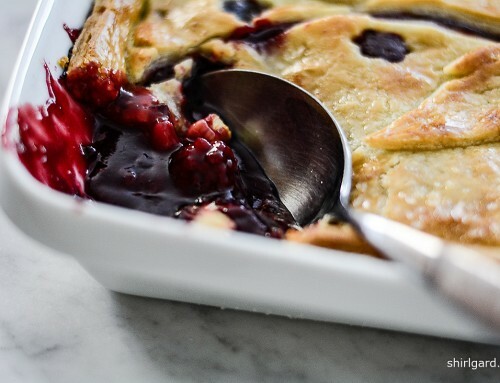 Some recipes suggest using a food processor, the same as you would a pie dough. 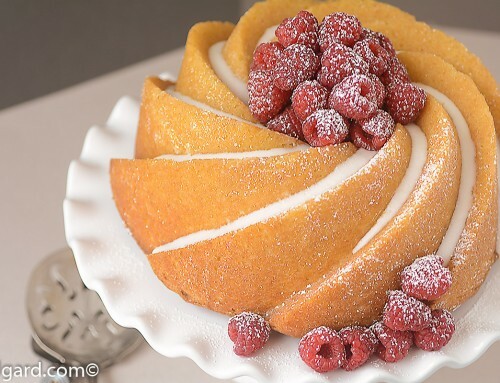 I have used all of these methods and, although they may work for you, I have personally discarded two of them: the “two table knives” method and the “pastry cutter” method. Somehow, I could never get the “two knives” thing to work; I just couldn’t get the hang of it. Then there’s the pastry cutter, which I have but also never use, because it just seems really awkward. 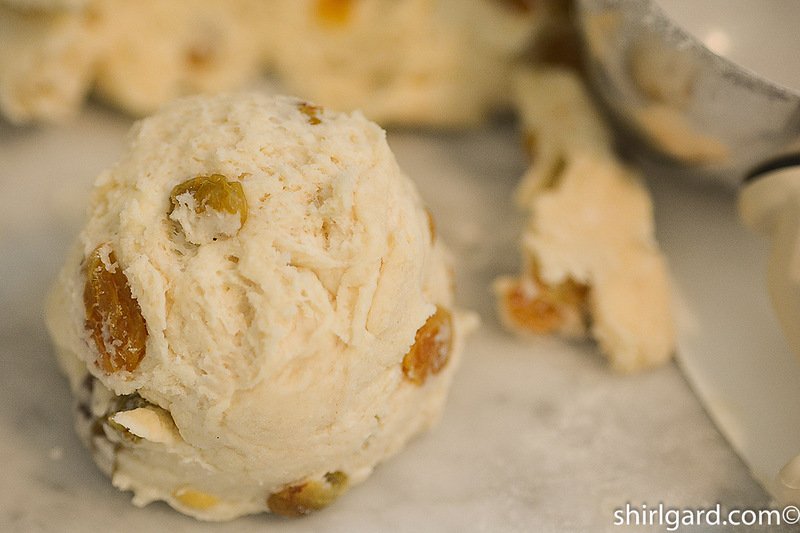 The mixer method works fine, and I am used to using it in the professional bakeshop, because it’s the only practical way to mix twenty pounds of scone dough at one time. 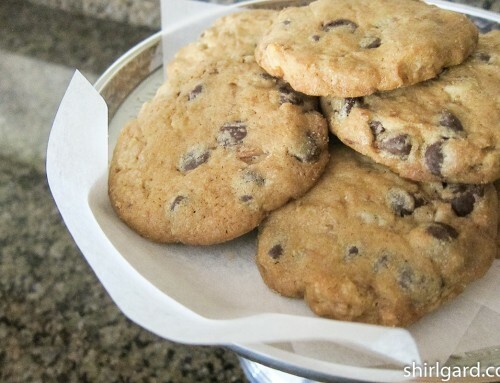 It also works fine at home with a small batch of dough, if you have a stand mixer. Caution, though, keep the mixer on a very low speed so the cold butter cubes don’t jump out of the mixer bowl along with the flour. I’ve seen this happen; it is not a pretty scene. A food processor is also great for “cutting in” butter, but depending on the size of your recipe, it may need to be mixed in batches. 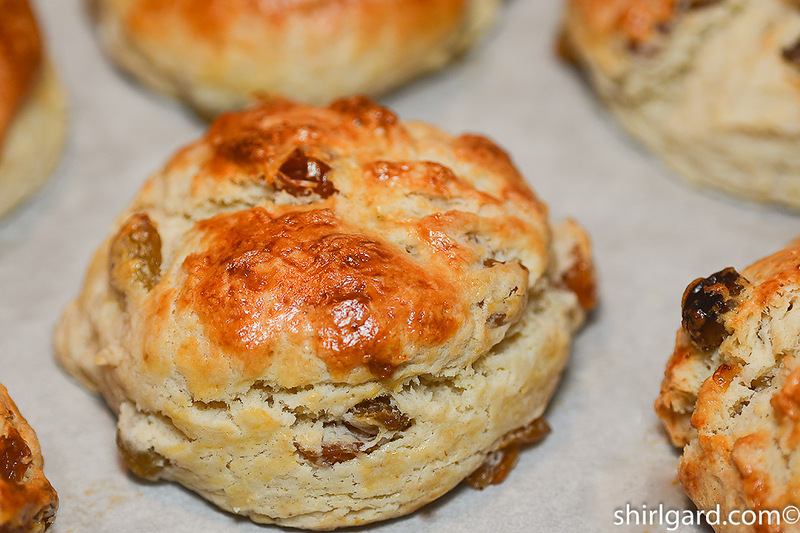 The answer to my question is this: I think the “best way” to mix scone dough comes down to preference, your personal preference, and what feels most comfortable on a given day with a given recipe. 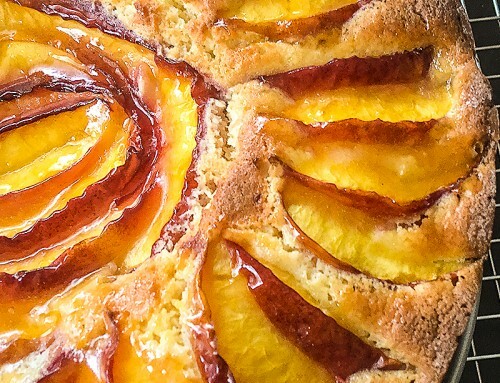 For me, today, with this recipe, the “best way” to mix the dough requires just me and my hands with a big bowl of flour (with the sugar, baking powder, and salt mixed in, of course) and some cold (very cold) butter cubes: no food processors, no mixers, no pastry cutters, and no knives. The hand method requires the recipe to be written using a different verb; it must now say “rub the butter into the flour”. Literally, that’s what you do; you rub it in with your hands. It’s important to work quickly so the butter stays cold. Start by tossing the cold butter cubes in the flour so they are totally coated with the flour. At first, the flour will feel soft and silky between your fingers with separate chunks of flour-coated butter. Then, begin mashing the cubes between your fingers to flatten them, tossing them around looking for big chunks. While you continue mashing and tossing the butter cubes, you can let your mind wander or you can look out the window (for me, at the autumn leaves that are turning now). This can be a fun and therapeutic process—it makes you feel good—I enjoy it. As soon as the butter becomes a little softer, start rubbing the butter between the palms of your hands into big flat flakes. Occasionally, with both hands, dip into the bowl and lift up big handfuls of the flour and butter mix, letting them fall back into the bowl. You will notice that any big chunks of butter that are still left will land on top of the pile. Finish rubbing in the butter until the flour mixture “resembles coarse meal flecked with flakes of butter”. When finished, the texture will have a granular feel instead of the soft and silky feel that you started with. You are now ready to add the liquids and finish the recipe. Wasn’t that fun? What is your preferred method of mixing scones? Let me know. When baking scones that are thick like these Sultana Scones, it is best to use a thermometer to check the internal temperature because the scones can look golden brown but still be dough-y in the center. I like to use a Thermapen® instant-read thermometer or a digital probe thermometer. I have both of these and use them based on the whim of the moment. The probe-type is less expensive and works great. I like to insert the probe into one of the scones after the crust is set and about 10 minutes before the scones should be done, closing the oven door on the cable that goes to the thermometer. When they reach the temperature that I have set, (210° F) in this case, the beeper goes off and you can remove them from the oven with confidence. Very easy! 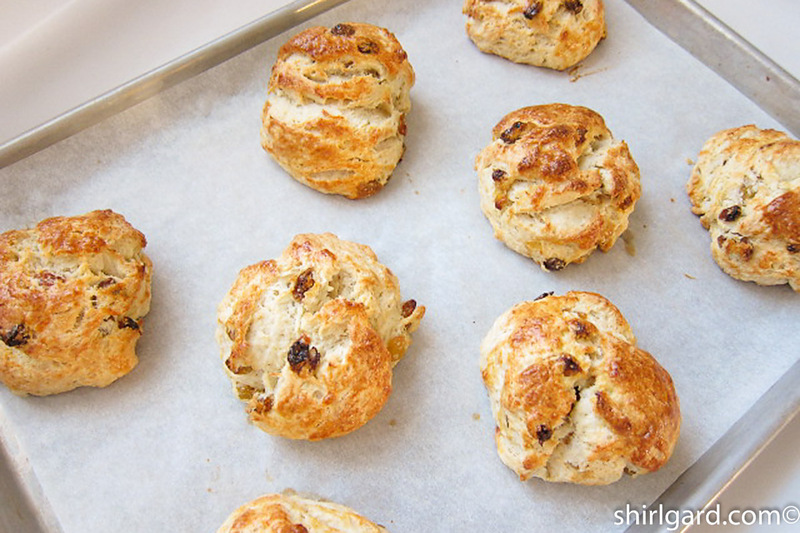 On the other hand, inserting a Thermapen® into a scone that you think is done is also very fast and easy. Deciding which type of thermometer you want is another one of those personal preference things. 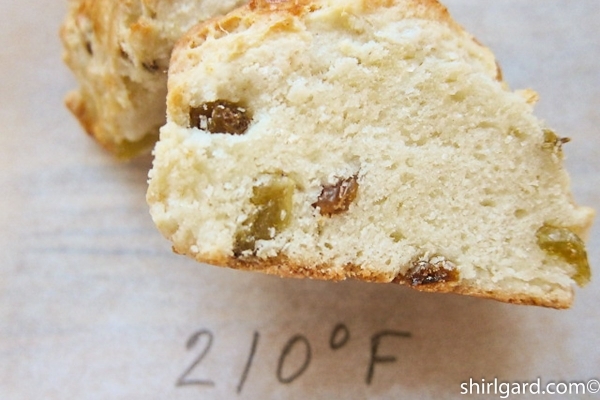 For fully baked scones, the internal temperature should be 210°F (99° C). Notice the differences in the 3 images below: They are all golden brown, but the first two are not done. 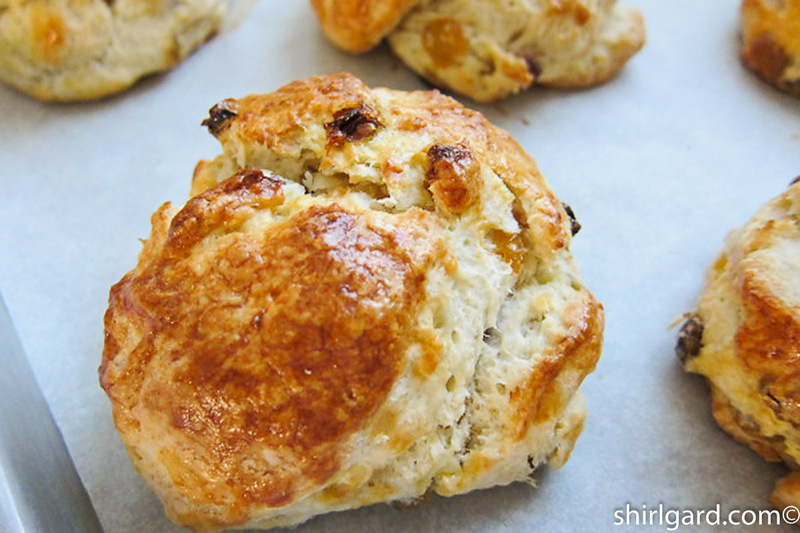 To determine when a scone is fully baked, it takes a combination of color and temperature. 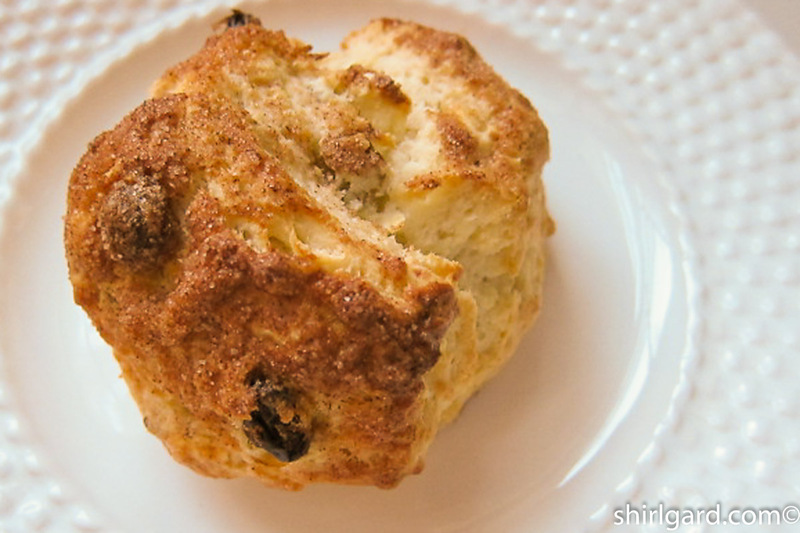 Mix 1/4 cup (50g) sugar with 4 teaspoons cinnamon (10g) and sprinkle liberally on top of the egg-washed scones. Sultanas, the Irish and British term for golden raisins, come from dried seedless white grapes. 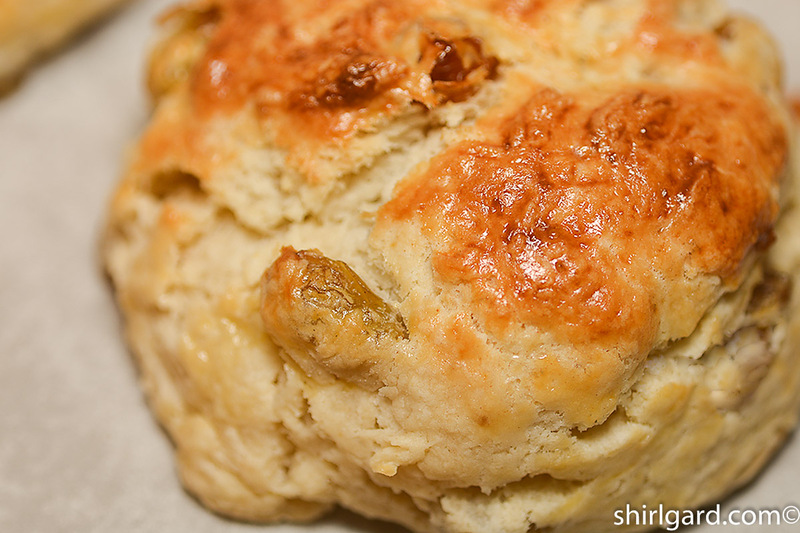 They tend to be plump and sweet, more so than other raisins, and make great scones. 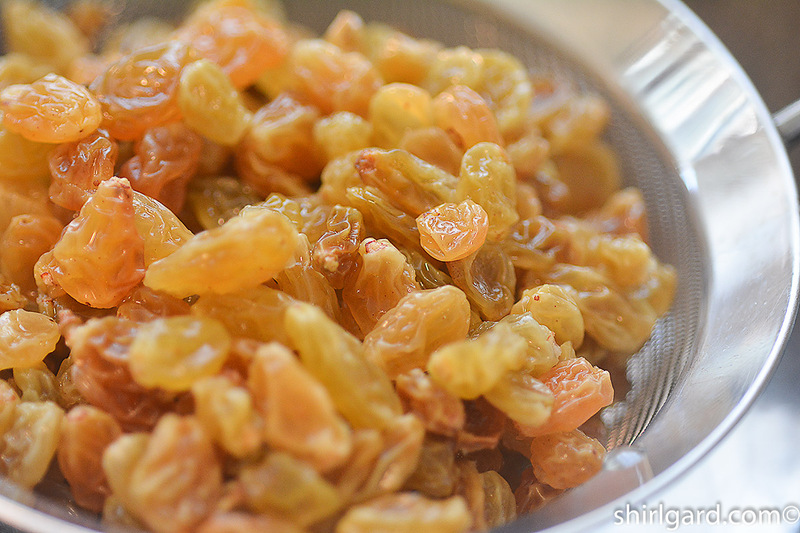 PLUMP RAISINS: Scale raisins and the soaking liquid into a 2-cup glass measuring cup. Microwave 1 minute on high power. (If no microwave, heat to a simmer in a small sauce pan.) Cover and let steep until cool. 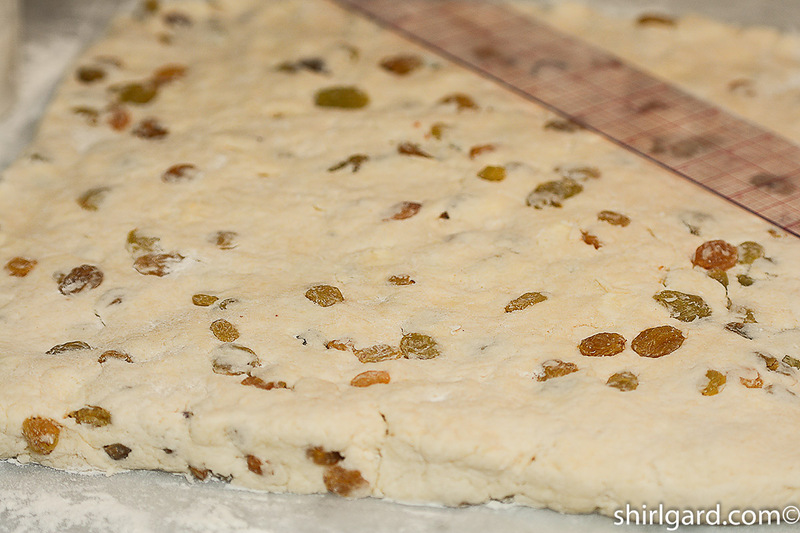 Drain raisins and blot dry with paper towels. PREP PANS: LINE two half sheet pans with parchment. Stack the pans on two more pans: this is called "double-panning" and prevents the bottom of the scones from getting too brown. PRE-HEAT oven to 425° F (218° C). WHISK dry ingredients together In a large mixing bowl. RUB in the butter with your hands: Add the cold butter cubes to the flour and mash between your fingers. As soon as the butter becomes a little softer, rub it between the heels of your hands to create large flakes. Continue doing this until the whole thing resembles coarse meal with separate flakes of butter. ADD cream: Stir and fold in with a large rubber spatula until the flour / butter mixture is half absorbed. 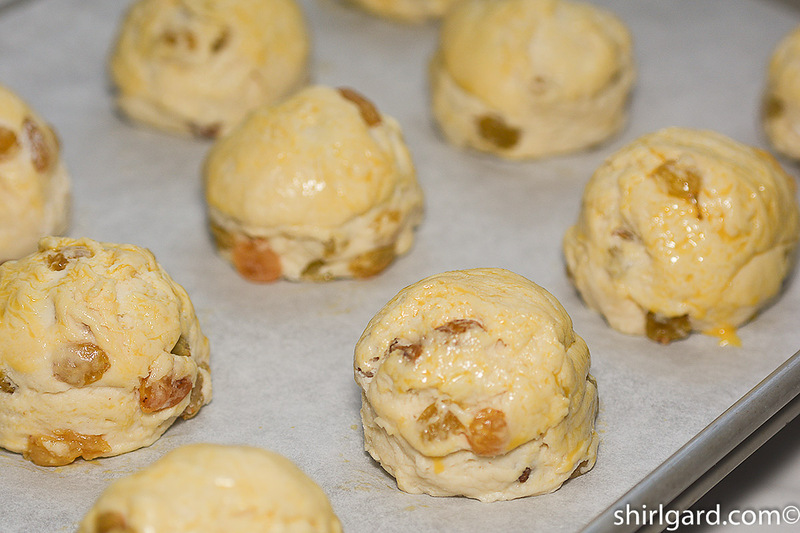 SCATTER the raisins over the top and finish folding together. Scrape up the flour from the bottom and sides of the bowl and press into the dough with the rubber spatula. 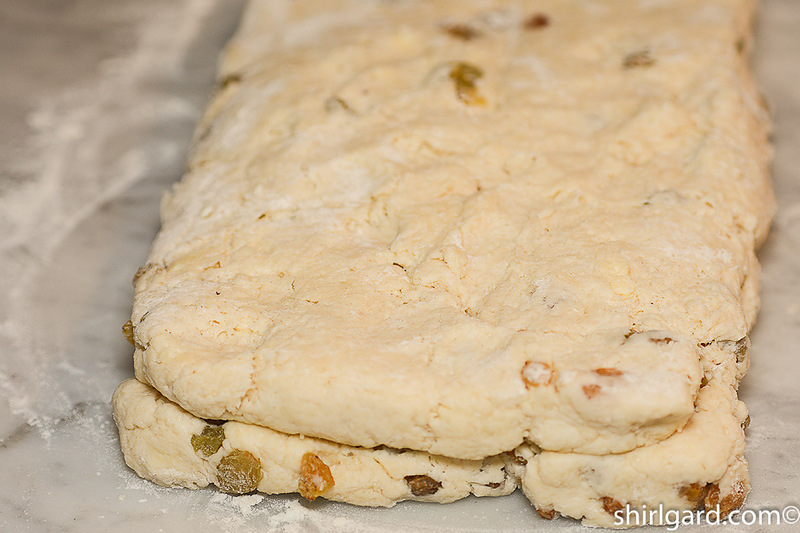 TRANSFER dough to a lightly floured surface and pat into a 12" X 12" square about ¾" thick. Fold in half. The dough will look very rough at this stage. REPEAT 3 more times for a total of 4 half-folds, each time rolling to a 12" square and folding in half. 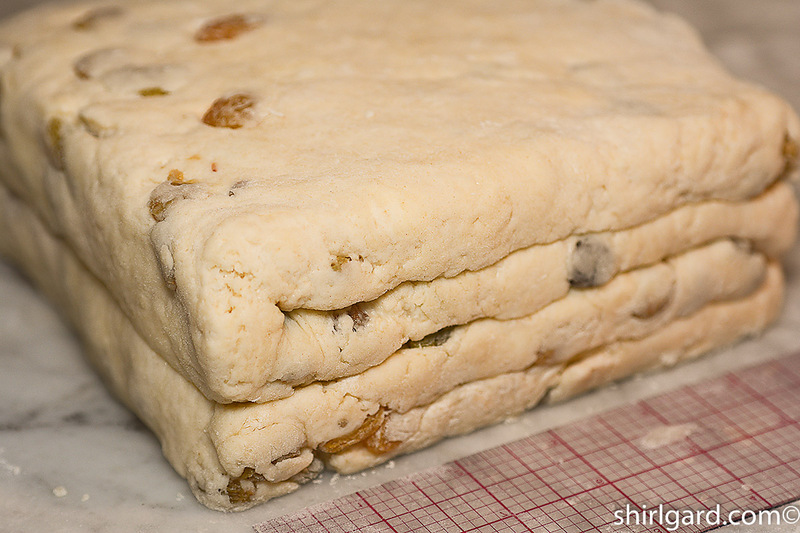 After folding in half the last time, fold the dough in half again, creating a thick layered 6" square. SCOOP dough using a #10 Ivory Scoop, pulling the scoop down through the layers of dough. 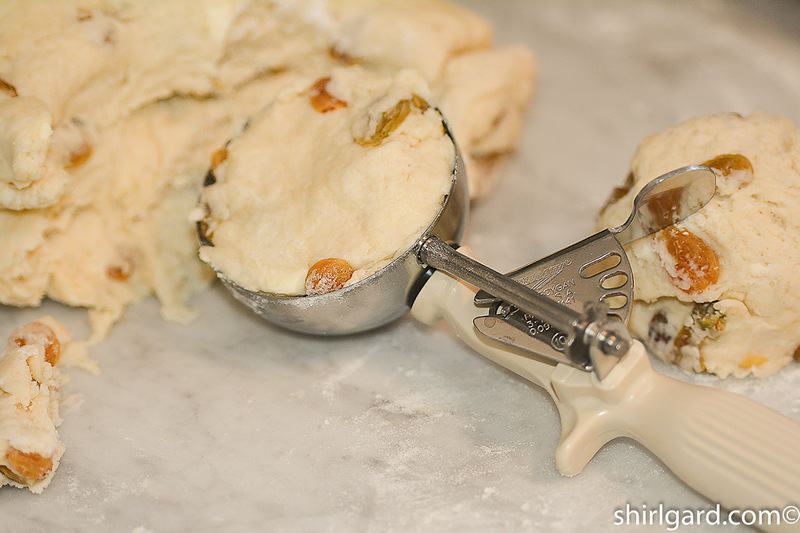 Press the dough into the scoop with the heel of your hand and level off. ARRANGE scoops on the parchment-lined double-pans. BRUSH tops of scones with egg wash. 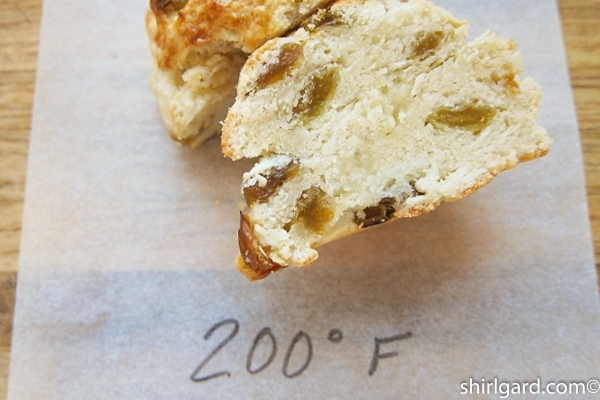 TURN DOWN the oven to 400° F (204°C) when the scones go in. 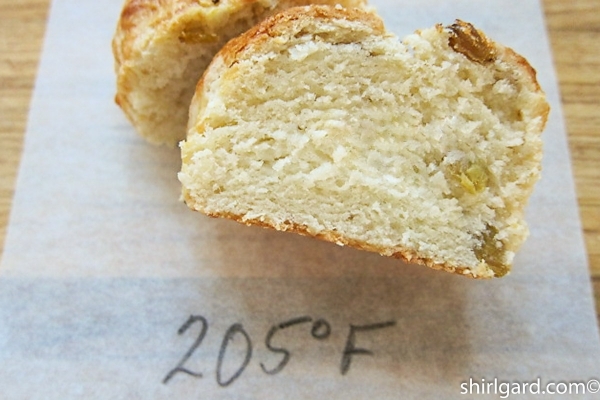 BAKE scones @ 400° F (204°C) for 20 minutes. Rotate pans. Bake approximately 12 minutes more, until golden brown. Total baking time = about 32 minutes. INTERNAL TEMPERATURE = 210° F (99° C), if using a thermometer. Recipe inspired by a recipe, originally from Ireland, printed in Saveur Magazine - March 2003.